At the end of November we (sort of on a whim) bought a little white house in the suburbs, and a few weeks ago, we sold our flat in the city. 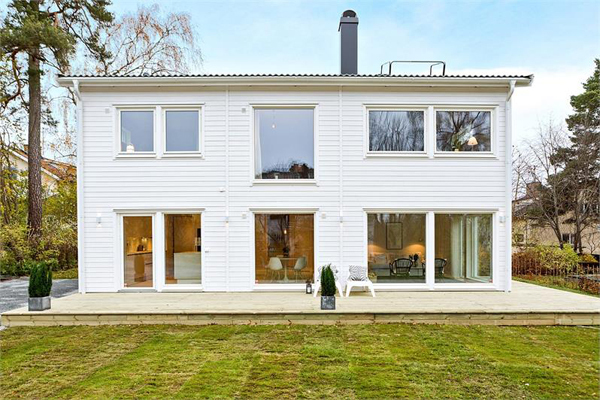 House hunters in Sweden (and many of those who aren’t even looking for a new home) stalk the Hemnet app checking in several times a day to make sure they don’t miss a new property to come on the market. All realtors publish properties on Hemnet and they all have the same format so it’s easy to compare. Real estate photos are really important here and there are tons of companies that focus solely on “staging” – getting a home to look its absolute best for sale. We staged our own flat with help from a friend who works with staging and interiors. Homes usually come out on Hemnet 10-15 days before they’re shown. Each home is usually shown 2-3 times over the course of a weekend, in short open houses. Sunday is the big showing day and most homes will also be shown on Monday evening. Some will have a preview showing on Thursday evening. Most open houses are 30-60 minutes long. We had 60 minutes midday on Sunday and 30 minutes on Monday night when we sold our flat, and the house we bought had the same. Of course if the seller agrees, you can sometimes get in on an early showing. At a showing you can have a look around, ask the realtor questions, and pick up a brochure and some other documents about the home. If you’re interested, you put your name and number on the list. On Tuesday morning, the realtor will call around to everyone on the list and see if anyone wants to make an offer. Most realtors publish the bidding on their website (which you reach via hemnet). Bidding is mostly done via sms. When a bid comes in, the realtor sends a text to everyone who has said they’re interested, and then other bidders can counter with a new bid via sms. Usually each bid has to be at least 10 thousand crowns (around a thousand dollars). Bidding can go on for several days (it took five days when we bought the house, even though there were only two bidders) or just a few hours – the bidding on our flat took less than 10 hours. The seller also follows the bidding via sms (and conversations with the realtor). When there is only one bidder left, and if the seller is happy with the price, you get together for a contract signing. The seller can choose to sell to whomever they like of the bidders at any time, and can also decide not to sell to anyone if they’re not happy with the price. The contract for a flat is actually only a few pages long. For a house it’s a binder of documents. After about a week, the down payment (usually ten percent) is due. If it’s a flat, the buyer has to be approved by the board of the building first. The rest of the payment is made at the time of the transfer of ownership which is usually a 2-4 months after the contract signing. And that’s it! Is the process more or less complicated where you live?